Sunday 6th July 2014 commencing 1500 hrs. 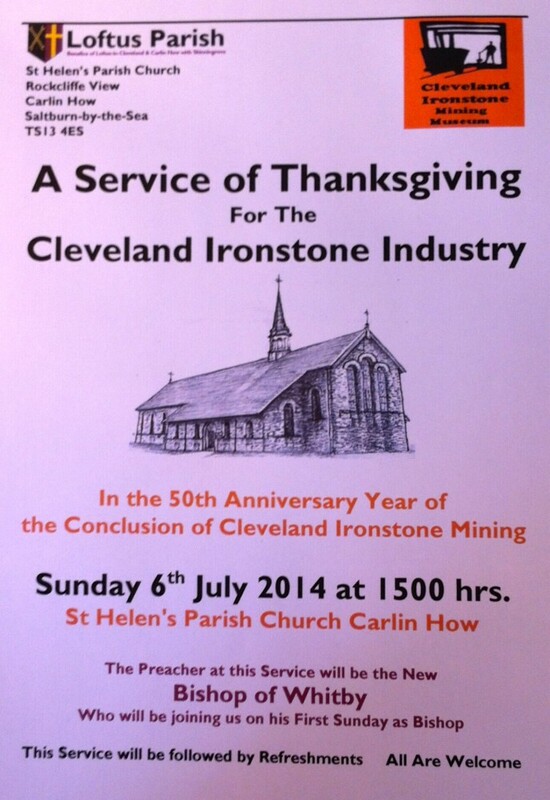 The Parish Church of St Helen Carlin How in conjunction with the Cleveland Ironstone Mining Museum Skinningrove are hosting a Service of Thanksgiving and Remembrance, for the men and women who worked in the ironstone mines and iron industries of Cleveland. By invitation of The Reverend Adam Gaunt Rector of Loftus, Carlin How and Skinningrove this unique Service of Thanksgiving will be led by The Right Reverend Paul Ferguson Bishop of Whitby who will also deliver the sermon. This will be Bishop Paul’s first Sunday in office as Bishop of Whitby since being consecrated bishop on Thursday 3rd July 2014 in York Minster. During the prayers of remembrance, eight special candles will be lit: seven to symbolise those mines within the Cleveland area which remained working up to the late 1950s and early 1960s; while the eighth candle will be dedicated to all the other Cleveland Ironstone Mines. The North Skelton Band will provide the music at the service, this is another link to our Cleveland Ironstone Heritage as the North Skelton Pit was the last to close on the 17th January 1964. We are pleased to announce that we are expecting a number of civic, political and industrial figures to join us for this Service as we remember and celebrate the great industrial heritage of East Cleveland and Teesside.